It's the summer of 1979, and a dry, hot, northern California school vacation stretches ahead for Rachel and her younger sister Patty-the daughters a larger-than-life, irresistibly handsome and chronically unfaithful detective father who loves to make women happy, and the mother whose heart he broke. Left to their own devices, the inseparable sisters spend their days studying record jackets, concocting elaborate fantasies about the life of the mysterious neighbor who moves in down the street, and playing dangerous games on the mountain that rises up behind their house. When young women start showing up dead on the mountain, the girls' father is charged with finding the man responsible, known as The Sunset Strangler. Seeing her father's life slowly unravel when he fails to stop the murders, Rachel embarks on her most dangerous game yet: setting herself up as bait to catch the killer, with consequences that will destroy her father's career and alter the lives of everyone she loves. Review: I enjoyed this book although it was totally different than I thought it would be. Based on reviews, I was expecting a mystery and I love the idea of the story being told from the perspective of the lead detective's family. However, this book is not a mystery, it's a story about sisters. Their parents are divorced and they live with their depressed mother, while their charismatic, womanizing father (whom Rachel, our narrator and the eldest sister, idolizes) makes an occasional appearance. When young women are murdered on the mountain behind their house, the girls are told to avoid the mountain. Not surprisingly, they don't listen. Rachel, never popular and on the cusp of puberty, is able to leverage her father's position as lead detective increase her social standing, much to her sister's chagrin. 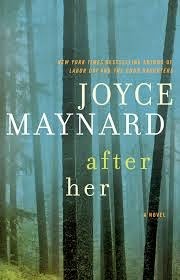 I really enjoyed Maynard's writing style and the pacing in this book. It is slow but I didn't mind because seeing Rachel and Patty explore their neighborhood and find things to do over their summer vacation really brought back a lot of memories of my own childhood. I loved Rachel's imagination and Patty's loyalty. Rachel, a late bloomer (who spends a good portion of the book anxiously awaiting her period) was a realistic teenager. She makes some bad decisions that are typical of a young teen (we all thought we knew it all at that age, right?). Rachel has a some psychic abilities that were a little odd and the ending...yikes, I didn't care for it. However, this was a book that I read in a day because I couldn't wait to see where the story would go.